America is facing an extinction crisis. 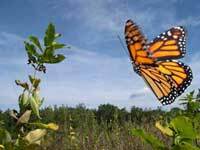 Monarch butterflies alone have declined 95 percent in the last two decades, due to habitat loss and increased use of herbicides. To truly counter this loss, and to revitalize these magical creatures, we need to go to the source of the problem. That's why we're starting a massive conservation effort, making it more profitable for farmers to help monarchs than to hurt them. And as we work to implement these programs, federal agencies are turning to states to lead conservation efforts and species management. We need our governors to make wildlife protection a priority. Take action today, and tell your governor to support much-needed conservation efforts. I'm writing today to ask that you do all you can to support much-needed wildlife conservation efforts. Hundreds of species are currently in the pipeline for listing decisions by the U.S. Fish and Wildlife Service and National Marine Fisheries Service, and as industries continue to expand and climate change increases the frequency of catastrophic fires and other extreme weather events, this problem will only get worse. Federal agencies are increasingly turning to states to lead conservation efforts and species management. That makes it more important than ever for state leaders like you to continue to support strong science, develop collaborative and bipartisan conservation plans, and protect our state and nation's natural heritage. Please continue to protect the natural resources that make our state a great please to live, work and visit. It's a win-win for the environment and the economy, and I hope that you will make protecting our wildlife a priority.